It’s not just about New York versus Neapolitan anymore. 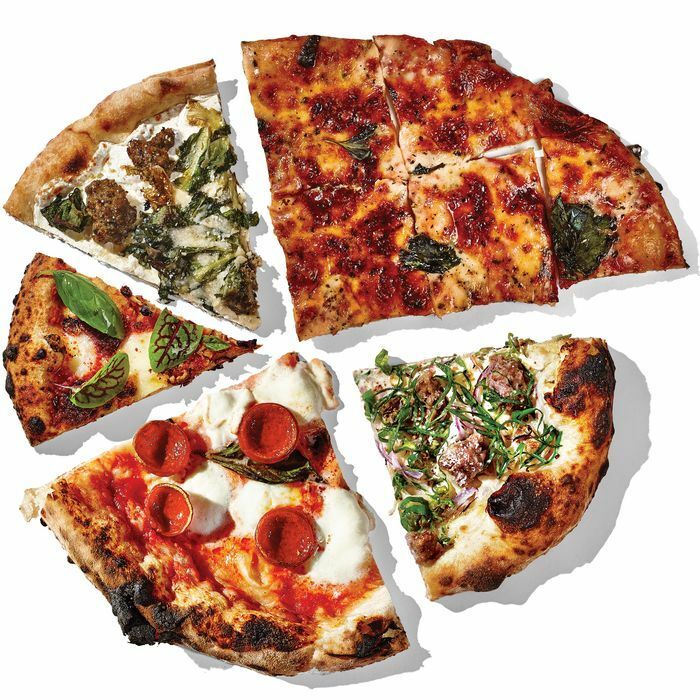 Here, an introduction to the city’s latest pizza styles. Chicagoans, it turns out, do not limit their pizza intake to deep-dish, the style New York pizza snobs refer to as a casserole with identity issues. That is the news at Emmett’s in the South Village, where the kitchen recently introduced New York to the pleasures of the Chicago thin-crust style ($18). Its defining features: a rimless 1/8-inch-thick crackerlike crust, a zesty tomato sauce minimally applied, and a three-cheese topping. The round pie is sliced into tiny squares, known as a party cut. A similar midwestern-style pizza called the Saint Louie can be found at Speedy Romeo in Brooklyn. The dough has always been the key component of good pizza-making, but perhaps never as much as when it’s masterminded by elite bakers like Tartine Bakery’s Chad Robertson, who consulted with his old pal Danny Bowien on his wood-oven-fired Hot Cheese Pizza ($14). Besides providing the sourdough starter, which lends the 24-hour-fermented dough its distinctive flavor, Robertson recommended a mix of flours: the conventional double-zero, plus a less refined organic blend of hard red winter wheat from Utah’s Central Milling. The tomatoes and buffalo mozzarella are from Italy, and the optional pepperoni from Di Palo’s. See also: Roger Gural’s baguette-dough pies at Arcade Bakery, and Jim Lahey’s free-form masterworks at Co. The biggest complaint New Yorkers have against ­authentic Naples-style pizza is that it’s wet and floppy in the middle, encouraging ­otherwise upstanding citizens to abandon propriety and eat it with a knife and fork. Laurent Tourondel has a solution. His wood-fired sausage-panna-and-shishito pie ($14) ­exemplifies all the ­winning ­attributes of a classic ­Neapolitan pizza but without the sag. This thing is light and airy with good crispness and just the right amount of ­tender chew. The toppings strike a nice balance between classic and creative, and the aggressively charred ­cornicione yields to none in the height department. Scratch-cooking is a given in this artisanal age, and so it is at the experimental Bruno Pizza, where the chefs mill their flour in-house, combining whole-grain healthfulness with an envelope-pushing approach that might madden purists. This can make for interesting, often polarizing results, but seems to be the wave of the future (Chad Robertson, for instance, will mill his flour at the Manufactory when it opens at San Francisco’s Heath Ceramics building). So do unorthodox toppings, like fermented tomatoes and lovage on the Margherita, bottarga on the Summer Greens, and spreadable pork sausage and stinky washed-rind cheese on the Nduja (pictured, $18). This is not a pizza style per se but a burgeoning topping trend. GG’s Italian Wedding pie (meatballs, escarole, mozzarella, and pecorino; $18), which interprets the flavors of the classic Italian-American grandma soup as something you can pick up and eat with your hands, is a good recent example. So are Marta’s Patate alla Carbonara pizza, Co.’s new Italiana (an Italian hero disguised as a pizza), and early adopter Otto Enoteca e Pizzeria’s Cacio e Pepe pie.